The Alexander Turnbull Library, The National Library of New Zealand, in Wellington New Zealand holds what we believe is the best-ever early map of the township of Newcastle. The map, at Shelf Location MapColl 817.95gbbe/1830/Acc.3580 was drawn by Surveyor John Armstrong, an employee of the Australian Agricultural Company, in 1830, and shows every building and every small detail in the early Town of Newcastle. How it ended up in New Zealand is still a mystery. J. Henderson & J. Armstrong. 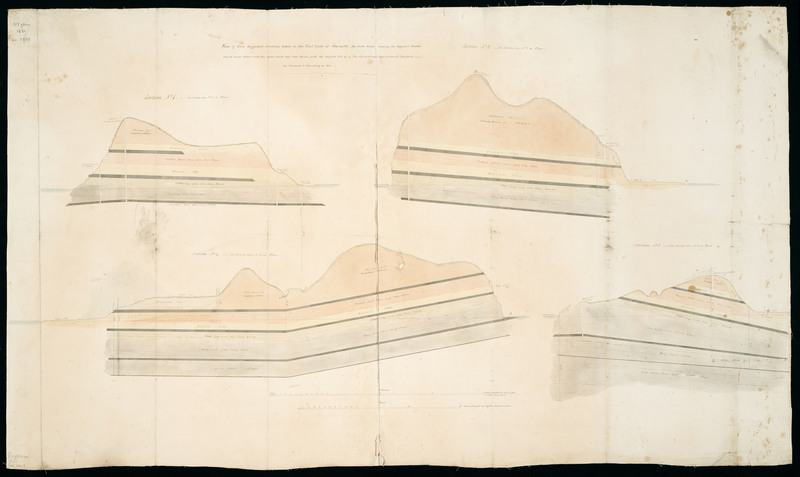 View of four different sections taken in the coalfield at Newcastle, New South Wales [ms map]; shewing the different strata which occur there & all spots which have been bored with the Engine Pit etc. of the Australian Agricultural Company. 1830. Scale 1: 2 376. Scale of heights 1:360. 73 x 127 cm. Shelf Location: MapColl os817gbhm/1830/Acc.3327 (Courtesy of the Alexander Turnbull Library, Wellington, N.Z.) It is presented below as a 5.8MB jpg file. These plans, along with the survey sketches of Sir Thomas Mitchell in 1828, and the paintings by Edward Charles Close and Joseph Lycett from the 1820s are our most trustworthy renderings of the Newcastle landscape at the time. We are currently using these drawings with our 3D Visual artist, Charles Martin, who with Russell Rigby are creating a 3D Newcastle which we hope we can again visit in time through the marvels of digital technology. University Archivist and Chair, University of Newcastle’s Coal River Working Party.